How Do We Know Humans Are Causing Climate Change? Yes, we know humans are responsible for the climate change we see today. But here’s the good news: Human-caused climate change can be human-solved climate change. We know that carbon dioxide (and other greenhouse gases) trap heat in the Earth’s atmosphere. And we know that humans are burning fossil fuels, releasing huge amounts of carbon pollution and trapping more and more heat in the atmosphere. There’s only one conclusion: humans are the primary reason we see our climate changing today. That’s the short of it. But let’s dive into the details. How Do Greenhouse Gases Make the World Warmer? Without naturally-occurring greenhouse gases (GHGs) like carbon dioxide, our planet would be downright freezing. That’s because greenhouse gases work like, well, a greenhouse. They let sunshine in and trap some of its heat in our atmosphere, making life on Earth possible today. When the delicate balance of these GHGs is maintained between what we add and what plants absorb, the long-term average works out like Goldilocks and the Three Bears for life: Not too hot. Not too cold. Just right. Another way to think of these gases is as a natural blanket — keeping the Earth about 60 degrees Fahrenheit (about 30 degrees Celsius) warmer than it would be normally. So, what’s the problem? Sounds like greenhouse gases are great. Who’s anti-blanket, anyway? Well, when humans burn fossil fuels, it’s as if we’re wrapping another, not-so-natural blanket around the Earth. That’s why things are heating up and the climate is changing. How Are Greenhouse Gases Related Fossil Fuels? The above NASA video illustrates it well. Fossil fuels — like oil, natural gas, and coal — “contain carbon that’s been locked away from the natural cycle for eons.” When we burn these fossil fuels, the carbon combines with oxygen to make carbon dioxide. This extra carbon dioxide (and other GHGs like methane) traps more and more heat in our atmosphere. Humans started harnessing fossil fuels on a massive scale during the Industrial Revolution. The Industrial Revolution began about 1760 and most historians mark its end sometime before the middle of the next century. Basically, it was a time of profound transformation. Before the Industrial Revolution, about 80 percent of the world’s population were rural farmers. But the Industrial Revolution changed how the world lived and worked, bringing millions to urban centers to work in factories. 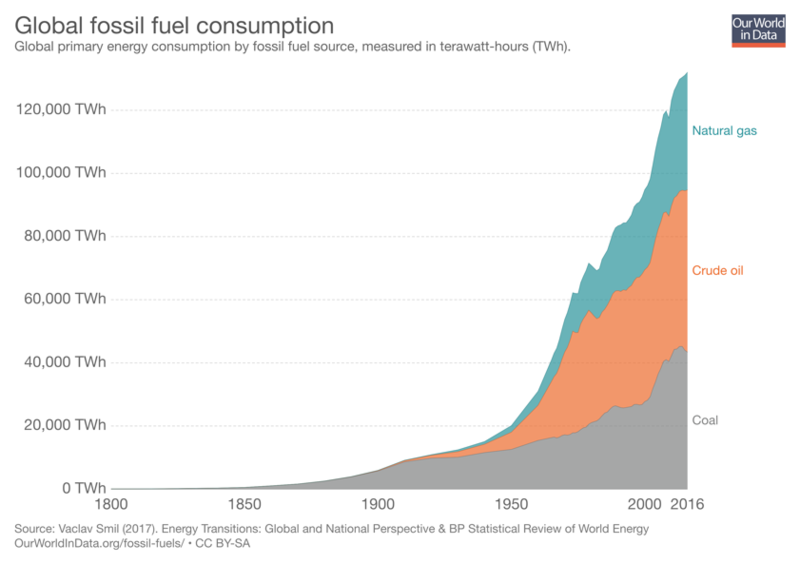 Global fossil fuel consumption since 1800. The revolution saw an incredible explosion in innovation. The coal-powered steam engine, internal-combustion engine, radio, automobile, and airplane were all born in or from technology developed in this period. Along with many other inventions we still see today. This time period totally transformed our world and the way humans live, but it’s also had big consequences. Perhaps the biggest one has been the soaring consumption of dirty fossil fuel energy around the globe. 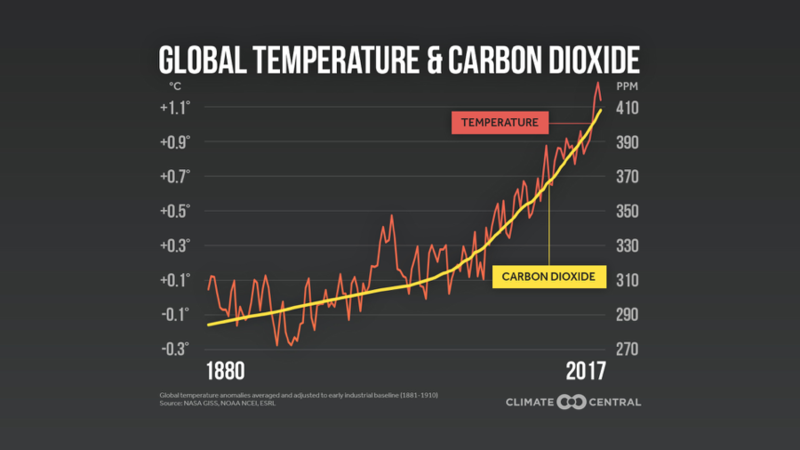 As the concentration of carbon dioxide in our atmosphere has increased since the Industrial Revolution, global temperatures have also steadily increased. In other words, there’s a strong correlation between more carbon dioxide and higher temperatures. And while the amount of carbon dioxide in our atmosphere has gone up and down over time, all the coal, oil, and gas we’ve burned over two-plus centuries mean it hasn’t been this high for hundreds of thousands of years. We’re simply adding more carbon dioxide into our world than it can absorb. Warmer temperatures aren’t the only fingerprint humans have left on our changing planet. Our oceans have become more acidic. We’re seeing more extreme weather events like hurricanes and wildfires, and the world’s glaciers and sea ice are melting. And that’s just the tip of the iceberg. It’s clear that we need to make the switch to clean, reliable sources of renewable energy like solar and wind. Unlike fossil fuels, renewables don’t add greenhouse gases to our atmosphere. They’re better for our planet and our health. You can learn more about solar, wind, and geothermal in our free, downloadable e-book How Renewables Work: A Practical Guide. Thanks to Big Polluters, there’s a lot of misinformation out there about these types of energy. But in the guide, we offer up facts and facts alone. Download it today! It’s never too late to make a resolution. Like many of us, you’ve seen the climate crisis unfolding and – chances are – you’ve wanted to make a difference. Make this the year you commit to speaking up and standing strong for a sustainable future. We’re here to help. All you have to do is sign up and tell us you’re committed to making climate action your resolution this year. 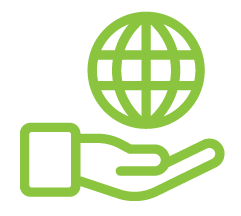 Once you do, we’ll check in every so often with exciting ways you can get involved in the climate movement to help you keep your resolution going all year long. Make climate action your resolution today.